A 28-year-old motorcyclist has died after crashing into a parked car in an Edinburgh street. 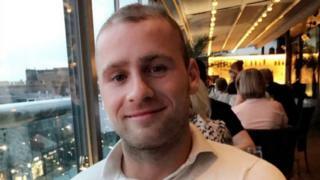 David McGarvey, from Edinburgh, was killed at 14:30 on Tuesday in Duddingston Park South near to the junction with Milton Road. Mr McGarvey, who was riding a Husqvarna motorbike, died at the scene. The road was closed for about five-and-a-half hours following the crash. The parked Saab 93 car was unoccupied at the time. Sgt Kos Papakyriakou, of Police Scotland, said: "Our thoughts are with the family and friends of this man who tragically lost his life as a result of the collision. "I would ask anyone who was in the vicinity of the area immediately prior to the collision, or who witnessed what happened, to contact police as soon as possible. "Similarly, anyone with other information relevant to this inquiry is asked to come forward to help with our investigations."